Of course they can! And sometimes they will really need to, especially if they’ve developed a rancid odor that’s got to go! Here’s how to make it work! Remove the laces from your sneakers. 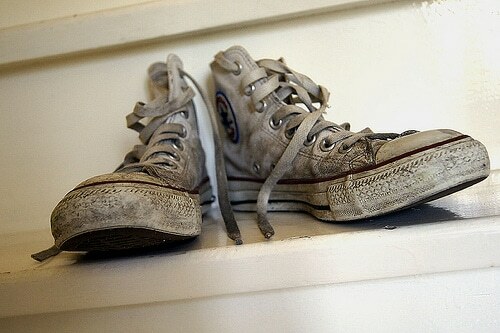 If they are dirty you’ll need to wash them separately or just replace them. If you have tough stains in your shoe, like dinginess from a rainy day or spilt oil from a construction site then you’ll need to do some real cleaning with cloth and a household scrub, like 409 or Mr. Clean. Tide pens are also an option on white shoes. Put your shoes in a laundry bag or pillowcase to keep them from hitting your washing machine and scuffing up the edges. Wash your shoes on the “delicate” cycle with cold water! Warm water can harm and make the smell worse and you want the clean to be effective not damaging. It’s highly recommended that you wash shoes alone and not with other clothing. Don’t put your sneakers in the dryer. Simply allow them to air dry. Heat will damage the shoes or rubber lining. In order for the shoes to maintain their shape while they dry, you will need to put newspaper in them while they dry.